I am so excited to start a new travel series! Last week my husband and I took a spring vacation to Savannah Georgia. We were so ready for some warmth and flowers after experiencing a blizzard in our home state just the weekend before. We left on Friday afternoon and spent the night with the kids in Illinois, the next day we drove to Knoxville, Tennessee to spend the night, and the following morning headed out to Columbia, South Carolina to see the "Riverbanks Zoo and Botanical Gardens". Now your probably wondering why we made that stop. Well, although we love zoos and botanical gardens, when planning our Savannah vacation I had a difficult time finding hotel availabilities from Sunday night through Friday morning. But, when I changed the dates to Monday night through Friday morning not only did more availabilities come up, but the prices came WAY down too! My husband saw there was this zoo and gardens only a few hours from Savannah, so he thought that a visit here would break up our trip a little bit and solve our hotel dilemma. I'm so glad he did, because we had so much fun this day exploring this beautiful garden and zoo. Because I have so many pictures to share, I'm going to divide this day into two separate posts. This week I'll cover the botanical gardens and next week I'll cover the zoo. On week three of this travel series I will then begin our Savannah experience. weather, every tree leafed out, and palm trees! I always get so excited when I see the first palm tree of a long road trip. 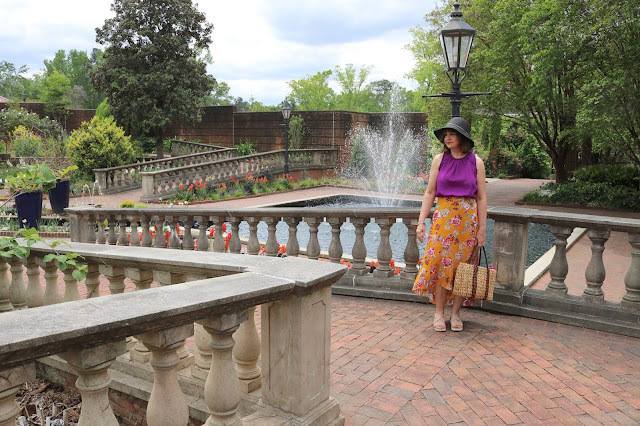 So when we arrived at the Riverbanks Zoo and Botanical Gardens and my husband asked me where I wanted to go first, well of course I said the gardens! To get to the gardens you have to enter through the zoo grounds and then you cross this beautiful bridge with gorgeous river views. When I entered the botanical gardens, I felt I was in paradise! Flowers, flowers, flowers everywhere! Oh what a sight for these spring starved eyes! The botanical gardens were small, but boy did they pack a punch! It was a beautiful mix of fountains, brick paths and walls, florals, and greenery. The design of the gardens was very European to me. I loved these stone fences. The brick walls and paths with the stone fences provided a beautiful background for all the flowers. I loved those purple hedges growing against the brick wall. And look at those charming light posts! The main garden had a beautiful water feature in the center. There were fountains on either end with a river running right down the middle. There was so much interest other than flowers. Just look at how much green is in the picture below, yet the different textures with the palm plant in the left foreground and the pine type tree right behind me along with those purple hedges provide so much contrast. I love the silver foliage in the bed by my feet too! Here is a view of the fountain with the "river" in the foreground. I love the smaller water fountains in the river. And aren't those tall cobalt blue pots simply striking? Look at the vibrant color in the photo below. Isn't that amazing? And these photos are not edited. I just love the purple/yellow/red combo against all the shades of green with the silver foliage in the forefront. Here is a view of the "river" with the second fountain in this garden. I LOVE these snapdragons! I need to plant these in my own garden. Aren't they beautiful? This photo is magazine worthy. Don't you just want to sit on the bench for hours? I do! Here is a far-away shot of the "river". It's the central focal point of the garden with flower beds and paths on either side all surrounded by a beautiful brick wall. And this view is taken from the opposite end of the "river" showing the second fountain in the foreground. I Love the palm trees. They add so much to a garden. I wish they would grow in Wisconsin! haha! This crazy but beautiful garden art sculpture was outside the garden facility building. I just love cobalt blue pots and garden art. They add so much color to a garden, especially since not a lot of flowers are blue. It provides a nice contrast. This is the garden directly in front of the garden facilities building. I could not stop smelling these heavenly white roses! Here is a side view of the second fountain. It was walled in on three sides by the stone fence. This large long bed of delphiniums was perhaps one of my favorite spots in the garden. I love delphinium. I use to have so much of it in my own garden, but sadly it all died away. It's one of those plants that although it's considered a perennial, in colder zones you really need to re-plant every year. Perhaps this year I will plant more! All the trees were wrapped in lights. I'm sure it's breath-taking after dark! I liked the square little gardens planted around each tree. "Look, it's a bird, a plane, no it's....a jasmine covered arch!" Jasmine is everywhere in the south. It's wonderful to walk the neighborhoods and whiff in this beautiful sweet scent! Oh, how I wish this were a perennial vine in Wisconsin too! I'd have it growing everywhere! A beautiful garden gate. Love the ivy covered brick with the black wrought iron gate. It was so fitting to spend the very first day of our vacation touring this beautiful garden. I was so depressed prior to our trip because we had suffered the coldest April on record and two major blizzards in Wisconsin. I felt spring would never come! It was so rejuvenating to my spirit to walk through this garden and see life once again. Thanks Mica! It was a beautiful garden, and I will be doing a fashion post on that outfit in the near future as well! Gorgeous photos and I particularly loved that blue glass (?) flower sculpture that was such a spectacular feature. Thanks Leanne! Yes, I loved that sculpture as well. So pretty, as are you, dear Amy. I too love delphinium but unlike you I've never been successful in growing them 😖. Hugs,x. Awww, thanks so much! Yes, delphinium is so fussy! Why do the prettiest plants have to be the most difficult to grow? Adding this to my list of places to visit, it's beautiful!! Oh, your kids will love it Brooke! Such a beautiful garden! Thanks, Amy, for sharing your photos. Looks like such a beautiful place and I love your outfit! Thanks Stacey, it was so gorgeous! I will be doing a fashion post on this outfit and the other outfits I wore to Savannah in the near future! Oh this looks like you had an amazing time! Thanks for sharing with us! Thanks Ruth! It was such a special day! So wonderful to finally experience spring! I love wandering through Botanical Gardens, Amy so thank you for sharing yours with us at Midlife Share the Love Party. My husband and I were in Barcelona last October and wandered through some beautiful gardens there. #MLSTL See you next week! I always try to visit the local botanical gardens wherever we travel. I can't even imagine the gorgeous botanical gardens Barcelona would have! Beautiful photos, and I love your outfit, too. It looked gorgeous against the backdrop of the botanical gardens. Thanks so much! I'll be doing a fashion post on that outfit soon! Thanks Anna! Yes, I love going to botanical gardens in a different climate than mine. I am not on Twitter but my Instagram account is ameliasfleurs. I joined your link up! Thanks for mentioning it! Oh my gosh, your images are beautiful and your outfit is stunning! Thanks for sharing! I really love visiting botanical gardens, too. Especially in areas that have a different zone/climate. What a beautiful place, I love the water areas as well!! I can't wait to get away later this month to some warmer weather. Altho, the weather is finally warming up in STL! This looks nice,warm and beautiful! I can't pass up a good botanical garden, and this is a corker!!! Thanks for the virtual tour; I felt like I was there and it made my day! Wow! Such a beautiful garden. I love the blown glass art and the fountain/river.